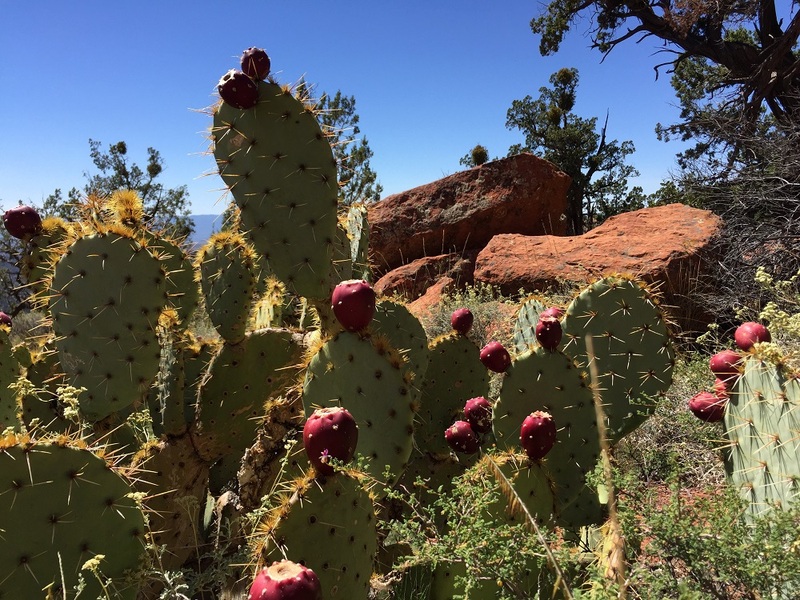 Let’s start with my desert hiking observations from last week in Sedona, AZ. I suppose this might bore 96% of you. But if you’re hiking out west soon, you’ll appreciate these thoughts, I hope. Greet fellow hikers as you pass by. People hiking trails rated “strenuous” are usually much friendlier than people on trails rated “easy” or “moderate”—must be a camaraderie thing. Kolsch and wheat beers are perfect post-hiking beers. Avoid real hoppy or dark beers. A nicely balanced pale ale works well too. Don’t forget a bottle opener and koozies/huggers. What is it about tequila and lime? Margaritas are my choice of beverage when indulging the night before hiking. I don’t get too fancy as long as it’s not rot-gut tequila. I like good ol’ regular margaritas, prickly pear margaritas, and pineapple and jalapeno margaritas—a new discovery. Whoever’s in front has to be absolutely sure they always follow the main trail and not a wash, side trail or game trail. Not mentioning any names. Watch out for cacti and snakes when taking a natural break. Beware loose gravel on slickrock, especially if you’re descending. If you have trouble with exposure and you’re crossing a fin or natural bridge, keep your eyes on where your next step is landing and, if you can, one step ahead of that—maybe where the person in front of you is stepping. For god’s sake, don’t look down at the drop or you may freeze. Stay focused on the present, one step at a time. Enjoy the beauty while you can—nothing is better than time in the high desert. Now that I’ve indulged myself in desert memories, it’s time for the list of this week’s webinars. If your company has a webinar scheduled in the next few weeks, please send me the link. I’ll be happy to feature it as long as it’s not too product-centric. The right technology can make engaging your members, driving revenue, and targeting key segments easy, when you know how to optimize the data. The tools to minimize time and maximize impact are housed in your association management system (AMS) and learning management system (LMS). Learn how to make the most out of your AMS + LMS to enhance your association, the top features to consider when shopping for association software, and how to navigate the marketplace and make an informed decision. 1 CAE credit. More info/register. Hybrid meetings and virtual events give associations the opportunity to engage members who cannot attend their annual meeting or other in-person meetings. Learn how hybrid meetings and virtual events can benefit associations and how to monetize them. Hear case studies illustrating association best practices. More info/register for in-person event. More info/register for virtual event. Accurate, timely data can transform strategic planning, member relations, and fundraising not to mention programs and services. But with tight margins and limited access to large datasets, what’s an association to do? Hear lessons learned from associations that have creatively leveraged existing data sources to gain useful insights into their membership and industries. 1 CAE credit. More info/register. If a website redesign is in your future (and, well, it is), tune into this week’s chat to hear about the top design trends you should be aware of, website redesign solutions for associations with small budgets, and much more. Watch/participate live or view the recording. Learn what it means to be 508 compliant and the benefits of embracing and focusing on accessibility. Discussion will cover: understanding accessibility in our world today; how increasing accessibility improves your bottom line; how to implement a culture that is inclusionary; and the Columbia Lighthouse for the Blind Accessibility Assurance services. More info/register. This live chat on Slack will focus on the duty of foresight: a board’s strategic responsibility and moral obligation to the association’s stakeholders. More info. Discover how you can protect your organization from the many thorny issues that can torpedo your meeting and impact your bottom line. Learn how to define service standards that will improve the quality of service and reduce the risk of liability; negotiate stronger indemnification clauses; evaluate due diligence when dealing with ADA issues, including food allergies; and clarify the responsibilities and opportunities under the Bill Emerson Good Samaritan Food Donation Act. 1 CMP credit. More info/register. Wed 9/28 at 2 p.m. – Are You Curating Your Best Event? These industry experts will share case studies of events like Forbes’ 30 under 30 and IBM Insight as well as the questions you need to ask before every meeting or event. Learn how to create content that will drive ticket sales, find the right balance between education sessions and networking moments, and new ways to deliver more to your event sponsors. More info/register. You have precious seconds to grab the attention of your audience before they decide to skip, skim, or read your email. With so much at stake, it only makes sense to maximize the effectiveness of your email design and template. Learn how to effectively organize content to maximize the reader experience, successfully use imagery to tell better stories, and create call to action buttons that drive conversions. More info/register. One of the greatest benefits of running a virtual event is the data you receive about your how your audience interacts with your content. The sheer volume of the data can be intimidating, though. Learn about strategies for turning numbers and tables into actionable insight about your audience. Hear how other organizations have improved their content and empowered their sales teams using virtual event data. 1 CEU hour. More info/register. Paying executives too much can have negative consequences: public anger, loss of tax-exempt status, and substantial fines on both the executives who receive the overpayment and the board members who approved it. But underpaying executives has risks too: valuable employees could leave for greener pastures and you’ll have trouble attracting the best candidates to lead your organization. Learn how to make sense of nonprofit executive compensation, so you can get it right for your organization. More info/register. Learn how to cultivate a professional LinkedIn network that demonstrates your wide variety of connections and how to best leverage your connections to land your dream job. The webinar will cover essential LinkedIn networking etiquette and the more granular aspects of making and maintaining connections in the context of an active job search. More info/register. Understand how to capture, analyze and visualize your existing association data to execute winning member-facing strategies. Learn how to mine the right data to improve your member’s experience; better understand the “why” and not just the “what” of your membership data; combine multiple data sources for a true 360-view of member and prospect activities; and determine a successful ROI on your collection and analysis of member data. More info/register. For many organizations, digital marketing is a new undertaking. Associations want to know how to best staff their organizations, craft campaigns and measure programs in the digital age. This webinar series will help your organization evolve fully into digital. 1 CAE credit. More info/register.